This Iraq Report describes planning and preparations for a major Corps offensive in central Iraq, Operation Phantom Thunder, which began on June 15, 2007. This backgrounder provides a bulletized summary of Operation Phantom Thunder. This order of battle describes U.S. forces involved in Operation Phantom Thunder. Al-Qaeda blew up a bridge on Sunday using a suicide truck bomb, the latest in a series of attacks against bridges in Baghdad and the “belts” of territory surrounding the capital. 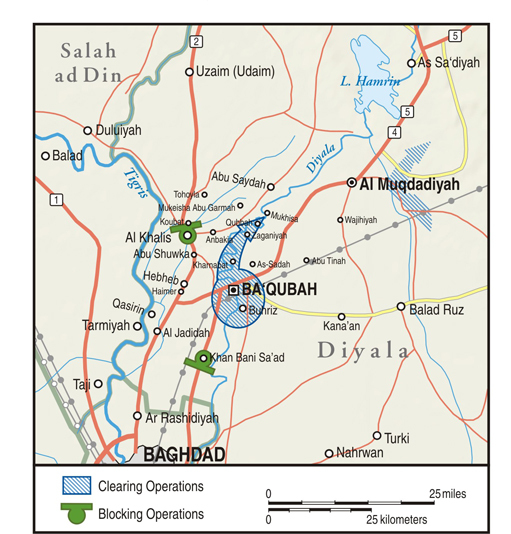 This Iraq Report describes U.S. operations in Diyala Province in early 2007, and the links between violence in Diyala and violence in Baghdad. This Iraq Report describes the Anbar Awakening and the transformation of Anbar Province during 2006 and 2007. This Iraq Report describes the first few weeks of the new Baghdad Security Plan (BSP), Operation Enforcing the Law, from February 10 to March 5.